My husband and I enjoy Thai take out almost every Friday night. They always throw in fortune cookies along side the napkins and forks. I very rarely eat fortune cookies. The few that I even bothered to crack open normally have some silly phrase that we jokingly add ‘in bed’ to the end. Now I suppose that could be said about the fortunes I have pictured to the left but they mean a tad more to me. The fortune on the top reads ‘You will obtain your goal if you maintain your course’ and I received this right about the time I decided to seriously consider publication for my novel. I was in full edit mode and getting frustrated and questioning everything I was doing. This came at just the right time to seal my conviction. I thought that it was very fitting so I kept it at my desk and I refer to it when I’m frustrated. 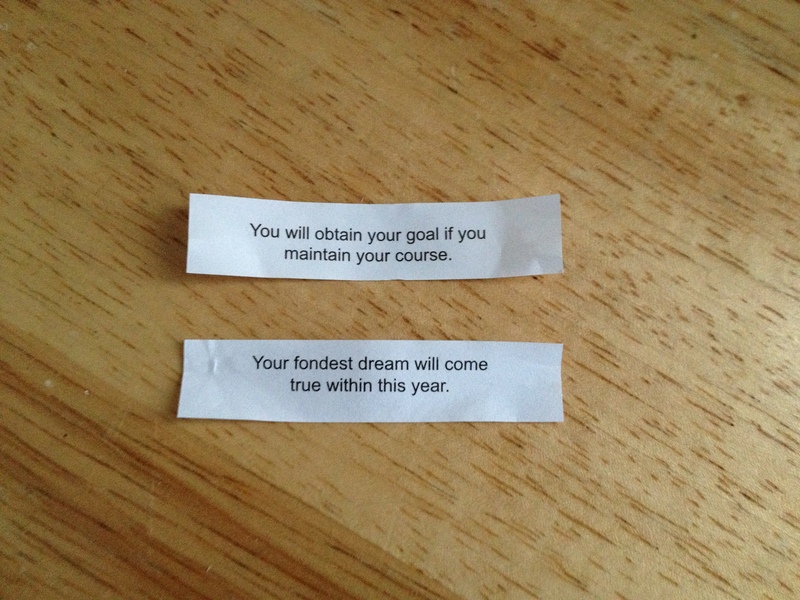 Just this past weekend, I cracked open another cookie and received the fortune on the bottom which reads ‘Your fondest dream will come true within the year’. That’s rather specific and again right on target with what I am trying to do. I am trying to get my novel published and I guess you could categorize it as my fondest dream. I used to think that I was a patient person but I’ve never had to wait to hear from publishers before. It’s almost torture. So this fortune came at just the right time to soothe my nerves and reassure me. It now keeps my first fortune company at my desk. I hope that it’s true, although I know that they are random. They arrived right when I needed them, lets hope that they are correct. I look forward to seeing my novel in print. Or winning big in the lottery. That’s my fondest dream too.